The Shetland Islands comprise more than a hundred islands, with just fifteen of them inhabited. The islands span one hundred miles (145km) between Fair Isle and Out Stack, the northernmost point of Britain. Around 23,000 people live on the islands. The Shetland Islands are faced with a significant energy supply challenge. They are located some 130 miles to the north of the British mainland and are not connected to the Great Britain electricity system, and therefore rely on local sources of generation. 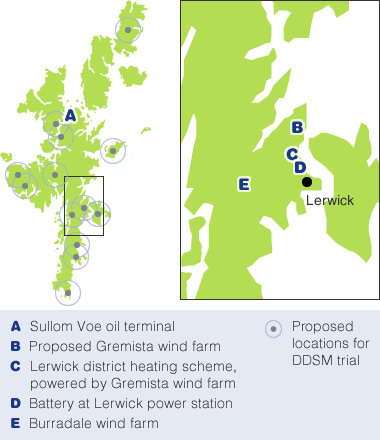 Demand for electricity on the islands ranges from a minimum demand of around 11MW, to a peak of about 48MW mostly centred in Lerwick. There is no gas supply to properties on the islands, and heating needs are met by oil and electricity. a number of small-scale community-based wind generators. Shetland has some of the richest renewable resources in Europe. Burradale wind farm is one of the most effective wind farms in the world with average output capacity of around 50%. Most of European wind power capacity is closer to 20%. However, this renewable potential cannot be fully utilised at the moment due to restrictions of the electricity infrastructure, and the need to balance the demand for electricity with the supply from the intermittent wind sources. At present, electricity supply to customers has to be met instantaneously by a response in electricity generation. This is difficult in an isolated network, where the Lerwick Power Station (LPS) is responsible for the majority of Shetland’s supply. This approach is inefficient when compared to integrated systems, and the station is now reaching the end of its operational life. Its necessary replacement is, in part, leading to the wider review of the current energy infrastructure and how this can be enhanced in the future. You can find out more about life in Shetland by clicking here.